But surely, I thought, veganism and faith were about to intersect in a powerful way. They did not. There is something very powerful about expectations. I remember, as a child, when I expected a certain gift to be under the tree – and it was not – I experienced a great deal of disappointment. I know there are times when I disappoint my spouse. She expects me to do something (or not to do some thing), I do something different than what she expects, and voilà, we are sitting down having one of those conversations (my partner is a wonderful communicator!). One of the psychologists I have studied the most, Albert Ellis, is supposed to have said something like, “The best way to go through life is to lower your expectations.” Though I have not actually found those words in the books of his that I’ve read, there are many mental health professionals who toy with this idea of how low expectations may increase happiness. I believe there is little doubt that expectations best serve us when managed. My unrealistic expectations create upsets, and upsets lead to disappointments, and too many disappointments can lead to places we don’t want to go. 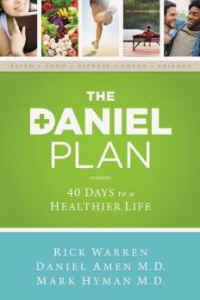 The reason I tell you this is because I did not manage my expectations when I read The Daniel Plan: 40 Days to a Healthier Life. Let me be honest and tell you why I was disappointed. The book is written by very well-known men. Rick Warren, the mega-church minister and author of books which have sold in the millions, and Drs. Daniel Amen and Mark Hyman, both well known in their respective fields and both featured on PBS television specials. These men hold great influence in our world around the areas of faith and health. And when I discovered they had teamed up to write a book called The Daniel Plan, I really felt like that child hoping to find something especially for me under the Christmas tree. Now, why would I think they were going to do this? Why did I believe these men were going to proclaim veganism to the world? I based this assumption (this expectation) on the title of the book, The Daniel Plan. Daniel was a visionary and prophet in the Hebrew Bible (you may remember Daniel and the Lion’s Den). Rick Warren is a renowned pastor of a huge church. Though I, too, am an educated minister, I am admittedly no biblical scholar. But surely, I thought, veganism and faith were about to intersect in a powerful way. And he is correct. The story in the Bible tells us Daniel was in the custody of King Nebuchadnezzar who had seized Jerusalem. Nebuchadnezzar wanted to educate him (and others) in the ways of Babylon. 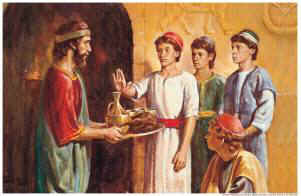 Nebuchadnezzar wanted to wine and dine them so ordered that Daniel and the other captives be given royal rations of rich food and wine. Because only the wealthy were able to eat much animal food back then, we can safely assume an abundance of meat was on the table. Well, Daniel performed better. The Bible says he performed much better! “In every matter of wisdom and understanding concerning which the king inquired of them, he found them (Daniel and his two companions) ten times better than all the magicians and enchanters in his whole kingdom” (Daniel 1:20 NRSV). So, can you see where I might think Rick Warren was going to talk about the benefits of a vegan diet and lifestyle? Though The Daniel Plan did not meet my expectations, I will say that if you follow the plan, I believe you will be healthier than if you eat the Standard American Diet. 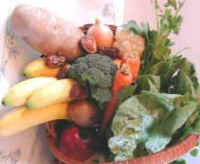 It emphasizes whole foods, lower consumption of animal products, exercise, and community support. All of these are essential in helping people make better choices and live healthier lives. So, would I recommend The Daniel Plan? Yes, I actually would. I believe there would be far fewer deaths of humans and animals if everyone ate the way The Daniel Plan suggests. And if you like your diets with a little bit of religion thrown in, this might be a good way to start doing better by your body and your faith. But if you are looking for a vegan message, you will be like a child who expected a certain gift to be under the tree, only to find a pair of socks. The socks are good, you need them, but they’re still just socks. Rev. Russell Elleven, DMin, VLCE is an ordained minister and graduate of the Main Street Vegan Academy. You can follow him on Twitter (@Health_Minister) and sign up for his brief weekly message through his website The Minister of Health, LLC.